In order for Social Security to work, people have to believe there’s some possibility that the world will last forever, so that each old generation will have a young generation to support it. The overlapping generations model, invented by Allais and Samuelson but here augmented with land, represents such a situation. Financial equilibrium can again be reduced to general equilibrium. At first glance it would seem that the model requires a solution of an infinite number of supply equals demand equations, one for each time period. But by assuming stationarity, the whole analysis can be reduced to one equation. In this mathematical framework we reach an even more precise and subtle understanding of Social Security and the real rate of interest. We find that Social Security likely increases the real rate of interest. The presence of land, an infinitely lived asset that pays a perpetual dividend, forces the real rate of interest to be positive, exposing the flaw in Samuelson’s contention that Social Security is a giant, yet beneficial, Ponzi scheme where each generation can win by perpetually deferring a growing cost. Professor John Geanakoplos: All right, well, today I’m going to talk about Social Security again. There’s going to be one more discussion of Social Security later. I’m going to defer most of my plan until later, but I want to finish the discussion so that we totally understand the subject. It’ll also allow me talk about demography and introduce one of the most famous models in economics called the Overlapping Generation Model. So in the 1940s someone named Maurice Allais, a French economist, introduced the Overlapping Generations Model into economics. He wrote it in French and it was sort of rediscovered by Samuelson in the 1950s. I’m not sure whether Samuelson had read Allais. I think Samuelson may well have read Allais, but anyway Samuelson–so these were 1947, something like that, 1958 in which Samuelson rediscovered it. And you’ll see it’s a very basic thought and it seemed at first to challenge everything that we’ve learned so far. So the idea of the Overlapping Generations Model is that time doesn’t have a beginning and an end like we’ve assumed so far, time might go on forever. Now, whether or not you believe time–whether there’s scientific proof that time goes on forever or scientific proof that the universe has to come to an end, let’s face it, many of our institutions presume that time goes on forever. The chief most important among them is Social Security which we’ll see is the easiest thing to, the model’s design to understand. The idea of Social Security is the pay as you go Social Security. The idea of Frances Perkins was that every young generation was going to give money to the old, but they shouldn’t worry so much about it because when they got old the next young generation would give them money. Obviously if you thought time was going to come to an end the last young generation, knowing that they were the last generation, would refuse to give money to the old because they weren’t going to get anything back when they were old. But then the second to last generation knowing that when they got old that they’d get nothing from the last generation’s young they wouldn’t give anything either to the old, and working backwards like that if everybody’s rational and it’s common knowledge that the world is going to end nobody would ever participate in the Social Security scheme. So it’s clear that there’s some thought that the world might end, or at least there’s a thought that it’s not worth bothering about the world ending. So the Overlapping Generations Model is meant to take that idea extremely seriously and imagine life going on forever. So let’s take the simplest example where there’s a generation that begins–generations last when they’re young and old. So let’s say we’re at time 1 here, and there’s a generation that’s young and a generation that’s old. Maybe I’ll write it a little bit lower. Sorry about that. So there’s an old generation and a young generation and the endowment of the old generation is 1. The young generation has 3 when it’s young, 1 when it’s old, 3 when it’s young, 1 when it’s old, 3 when it’s young, 1 when it’s old. So when you’re young you have 3 apples. When you’re old you have 1 apple. The next generation when it’s young has 3 apples. When it’s old it has 1 apple and so on forever. So this’ll be T = 1 here, 2 here, 3 here, 4 here, etcetera. So it goes on forever like that. Now, what did Allais and Samuelson both basically say? They both basically said, look, everybody when they’re young is incredibly well off. They’re working. They’re productive. When they’re old and retired and feeble they don’t have very much, but what can you do? Where can you trade? According to Samuelson what does the old have to trade? It doesn’t look like there’s any trade that can take place. So it seems like it would be very helpful if the young would give the old something, and when they got old the next generations young could give them something. So the young could constantly be making gifts to the old. That was Allais and Samuelson’s idea and it’s very closely related to Social Security. So Samuelson got a little carried away with his idea and he said that Social Security was the greatest and only true beneficial Ponzi scheme ever invented because in a Ponzi scheme, this has gotten a lot of attention lately thanks to our famous Madoff. So a Ponzi scheme is basically an investment strategy where you take the money that people give you, and you buy yachts with it, and then when they ask for their money back you tell them that you’ve gotten great returns and you just hand them money that new people have given you. So they think you’ve gotten great returns. And when that second generation of people wants their money back you tell them, well, you’ve invested it brilliantly, you’ve gotten great returns, but all you’re doing is giving them the money that the third generation is giving you, and you keep going like that until finally you owe so much money you can’t find new people fast enough to pay the people off and then everybody discovers the Ponzi scheme and it all unravels. And the people at the beginning have made out very well and the people at end who, you know, the second to last generation they’ve lost all their money and then lawsuits accumulate. And it’s quite interesting that in the Ponzi scheme the very first generations that benefited are not free because the whole thing was a scheme. The guy Madoff running it knew from the beginning what was going to happen. And so those first generation of people, there’s no reason why they deserve to make their great returns. They benefited from the Ponzi scheme, so the last generations suing Madoff are effectively suing the first people as well, and so we’ll see how the courts decide it. But often the people who get out of the Ponzi scheme early still are held liable and the money is taken back, so we’ll see what happens in this case. But anyway, so obviously Ponzi schemes are terrible ideas in general. But Samuelson said well, when life is going on forever there might not have to be an end to the scheme. It just keeps going. This guy gives to this guy. This guy gives to this guy. There’s no reason for the Ponzi scheme to end if you really think that the world’s going to go on forever, and therefore Social Security is a great Ponzi scheme which is actually beneficial. So Samuelson even wrote this as a journalist for Newsweek and there’s many–I happened to be a little boy when he was writing this stuff and I remember some of the articles and I’ve gone and found them. And so he describes the benefits of Social Security as a Ponzi scheme. So this didn’t turn out to be quite right, but it certainly sounds plausible. Another thing he said was he said that in the Social Security–money, you could think of as a Ponzi scheme, money too, because you have worthless pieces of paper, but you’re willing to hold them when you’re young, you’ll accept them for goods because when you get old you can find the next guy who’s willing to give up goods for your money, and that guy is willing to take the money for it because when he gets old he can find the next generation’s young who’s willing to give up good for his money. So the money, which is a worthless piece of paper, never gets exposed as being worthless because there’s always another generation around to take it who thinks they’re going to be able to use it later. So these are fascinating topics that Samuelson discussed, but I don’t want to discuss them in this class. I want to discuss Social Security, and so I’m going to do a variant of the model that Samuelson never thought about, which I think is a much more realistic model. So I’m going to do overlapping generations with land, and you’ll see that in this model I’m going to add land to it. It’s, I think, a more interesting model and I’m not going to discuss the paradoxes of infinity because once you put land, even though time goes on forever the paradoxes disappear. So rather than spending all the time on the paradoxes, and how they come about, and do they make sense, I’m just going to add land from the beginning and it will recapitulate in a nice way almost everything we’ve done this semester and there won’t be any paradoxes. So what do I mean by land? I mean suppose that land produces 1, so this is land output, produces 1 every period. So there’s another output called apples that just, you know, a tree that’s going to live forever, let’s call it land, produces 1 every single period. So here are the periods and this is what’s happening in every period. Now, land seems to make the situation much more complicated, but in fact it will turn out that we can analyze this pretty easily. So let me summarize, again, the model. The model is that every generation has 1 agent or a million identical agents, let’s say. Every generation has endowments, so every generation t has endowment. It’s generation t so it’s an endowment at time t and at time t + 1 equals (3, 1) and let’s say they all have utility and the utility of every generation t, which only depends on what they consume when they’re young and old let’s say is log xt + log xt+1. So everybody cares about consumption when they’re young, consumption when they’re old, they don’t care about consumption any other time. They begin with 3 apples when they’re young. They know they’re going to have 1 apple when they’re old. Everybody’s like that for generation t greater than or equal to 1, but generation 0 just has U0, so I can call that Ut. Generation 0 only cares about consumption when old and that’s that guy at the top. But I also have to talk about the land. Generation 0 owns the land. So that’s the economy, very simple economy, but it looks much more complicated than anything we’ve done before, but it will turn out not to be, but it looks it at first glance. So every generation has 3 apples when young, 1 apple when old except the very first generation which has land in addition to his 1 apple when old, and that land produces 1 apple forever. So we have to figure out what equilibrium is and then we have to look at Social Security. And by doing this we’re going to understand Social Security much better than we did before. So are there any questions about this, what’s going on? Then I’m going to try and write down what equilibrium is and then solve it, and then we’re going to talk about Social Security. Yep? Student: Is U not supposed to be <>? Professor John Geanakoplos: Oh, well if you only can eat 1 good if I put log x1 here it would be the same thing. Remember if I take a monotonic transformation, if I double the utility or take the utility, e to the utility like that, which is just equal to x1 it describes the same utility. The guy’s not trading anything off. There’s only 1 good, so more of the good is better for him. It doesn’t matter if we call it log x or x1 is the same thing, but that’s a good question. Let’s call it log x1, make him symmetric. All right, well, how would we define equilibrium? So there’s financial equilibrium, and then we’re going to see if we can solve this. So what’s happening in financial equilibrium? Well, it’s kind of interesting here. There’s going to have to be a price of goods every period qt. That’s the contemporaneous price of apples. There’s going to be the price of land every period, pi, let’s call it pit. So this is apple price. So these are contemporaneous prices. With contemporaneous apple price, land price, what else do we need? Well, we have to decide what everybody’s going to consume every period, so generation t what they’re going to consume when young and when old. Then there’s generation 0, what they’re going to consume when old. What else do I need to describe equilibrium? That’s probably it. And so what’s the budget set everybody’s going to face? A budget set for t greater than or equal to 1 is the set of all–let’s call it young consumption and old consumption. So generation t because it’s going to consume something when young and when old, such that, what? What’s the budget constraint? Well, when they’re young if they want to consume goods they have to spend qt to consume goods. So this is young, call that Y. And when they’re old they’re going to have to consume, sorry, when they’re young they’re consuming–what else would they want to do? They might want to hold land so we could call that pit and I better add a theta here for their holding of land, pit theta, that’s how much land they hold. Remember how we did this? And then what have they got? We’ll they’ve got their endowment, time t. This is time t, let’s say. This is generation t. So their endowment is going to be ett, but that’s 3, so I might as well write ett just as 3. And what else have they got? Nothing? Everybody comes into the world with just apples when young and apples when old, so when they’re young they’ve got 3 apples they can sell. They can consume something, so 3 - q. The stuff they don’t consume they sell and they can buy land with it. Ah, god all this time this never happened. Sorry about that. And when they’re old what can they do? Well, when they’re old at qt+1, times Z now, are they going to bother to hold the land when they’re old? No, because they’re going to be dead and they don’t care about their children. All they care about is eating as much as they can. So they’re going to sell all their land, so that’s got to be less than or equal to, what? And so here’s the–what are they going to get when they’re old? Well, they have qt+1 when they’re old, and their endowment, of 1 + what? They can sell their land pit + 1 times theta. Whatever they bought the first time they can now sell when they’re old. Plus what else do they have? So one last term, what else is it? So see what they do. Why would you buy land? Well, because when you’re young you’re so rich you don’t want to consume everything when you’re young, so instead of consuming your whole 3, you consume less. You buy the land because the land’s going to be worth something next period. So what is it going to give for you next period? What do you get next period from the land? Well, if you own the land you get what? You get the dividend. So the dividend we have to multiply by the price, which on one of the early classes I forgot. And the dividend is 1, that’s the dividend, but how many dividends do you get? How many apples? It depends on how much of the land you had. So if you had theta units of the land you get, you know, if you had 3 acres of land you get 3 apples which you can sell for a price qt+1. You also still have the 3 acres of land which you can sell off when you’re old. So that’s the revenue you get by selling off the land and you also sell off some of your endowment, maybe, and that’s how you can buy when you’re old. So that’s what the budget set is of the young, of every generation. And the budget set for generation t=0 is simply x1, is simply Z, we’ll call it Z such that what does this guy do? Well, q1Z has to be less than or equal to, what does he have? q1 times 1, plus he’s got all the land. So he’s got 1 acre of land. That’s all the land there was, so he’s got pi times–pi1. He’s got all the land, so I’ve normalized the land to be 1 acre. So pi 1 times all land. That’s what that guy can do. So equilibrium is, xt is best for generation t in budget set t and x1, so this is this and theta, and x1–did I write theta? Oh, I forgot to write theta in the definition of equilibrium here, so I have to write a theta t there also having to keep track of how much land they’re going to have. This is t = 1 to infinity. So the equilibrium is what are the prices every period of apples and land? What does every generation do in terms of their consumption and how much land they hold and how much does that very first generation consume. It’s obvious they’re going to sell all their land to consume as much as they can. So the budget set, so x1 solves. So Z = x1 and y Z theta equals that, best for generation t in this budget set, and Z = x1 is best for generation 0 in this budget set. So to say it in words it’s very simple in words, and then we have this mathematics and it looks complicated but we’re just going to say it’s going to be very short to solve it even though it looks very complicated. So the problem is this. We’ve got generations who are rich when young, poor when old, there’s land that lasts forever. The only way people can save is by holding the land. That’s like holding stock. That’s holding something real. So when they’re young they’re going to take some of their extra endowment, because they’re so rich when young, they’ve got 3 when young, and they’re going to use it to buy land. And when they get old they’re going to sell the land, and eat the endowment from the land, the dividend from the land, and sell the land and use that sale proceed to also increase their consumption when old. So they’ll be taken care of when they’re old because they’re able to hold the land. And the question is how do we solve for this equilibrium? And so why is it–so just to go back to Samuelson and all that, why is it so interesting? Well, one of the reasons it’s interesting is that people when they’re young have to think about the price of land next period when they’re old because they know they’re buying the land today. They can see the price today, but when they get old they have to, you know, why are they buying the land today, partly for the dividend next period when they’re old, but also for the resale value of the land. So everybody is thinking to himself, what’s the value of land going to be next period? And of course the value of land next period depends on what the young in that period are willing to pay, but they’re thinking about what they’re willing to pay on the basis of what they expect to happen the period after. So everybody has to think about the guy after him, and what the guy after him is thinking about what the guy after him is thinking, and it looks very complicated. And we want to solve for an equilibrium which everybody can rationally anticipate what the guy in front of him is going to do which means rationally anticipate what that guy is rationally anticipating the guy in front of him is going to do, and you have to solve for the whole equilibrium and see how it turns out. Any questions about this? It looks very hard, but it’s going to turn out to be very, very simple. Yes? Student: For generation 0 why haven’t we added the dividend that he would get from holding the land in the second period? Professor John Geanakoplos: By the way, I haven’t said what happens to the dividend in period 0. So actually I think that was a good point. So he gets 1. He also gets the dividend in period 0, so I’m glad you asked that question. So to answer your question, remember the convention that we’ve made which holds in the market and it’s one of the reasons for the breakdown of the market. One of the reasons why the market seized up in the last year or two, or the last year, is because when you buy a stock like the land somebody has to give the money and the other guy has to give back the stock, and the people buying and selling are not actually meeting each other and simultaneously transferring money for the ownership of the land. One guy’s in San Francisco and the other guy’s in New York and they’re doing it through some screen or something. So the physical asset isn’t quite changing hands. So you have to make a convention about when do you say the deal has actually concluded. So the convention is, that we always use, is that if you buy the land at time 0 you don’t get the dividends–at time t, if you buy the land at time t you don’t start getting the dividends until time t + 1. So if the young generation buys the land at time 1 they don’t get the dividend until starting at time 2. So the very first dividend at time 1 is going to go to the old guy at time 1, which I had left out here. So the old guy does get a dividend, it’s the dividend at time 1 because he began owning the land. So he had it before, so he gets that piece of land. Even though he’s selling the land at time 1 he still gets the dividend at time 1, and the generation that bought it at time 1 doesn’t start getting dividends until time 2. So that was an excellent question, and it was an oversight of mine, so exactly right. And that’s how it happens in real life. Of course, the length of time might be 3 days or it might be 1 month. It depends on the security, what the settlement rules are, but there’s always got to be a break between when you buy the stuff and when you start getting the dividends because it just takes time for the whole physical process to happen. So they say t + 3 is a very common kind of settlement, or t + 1. That means that in 3 days or in 1 day, and so if you’re desperate for cash and you have to give–so anyway, I won’t get into–we’ll come back to this when we talk about the crisis and what happened. So people who are desperate to get stuff, it doesn’t start coming for a little while, so. Any other questions? Yes? Student: Should we multiply the price of apples by q1? Professor John Geanakoplos: Should I what? Student: Should we multiply what <>? Professor John Geanakoplos: Absolutely. Very good. Any other comments? All right, now how do you solve this? Well, let’s figure out how to solve this. So the first thing you could notice is that–so Fisher never thought of having infinite time and never thought about Social Security. Maybe he thought about Social Security. I’m not aware that he had any thoughts about Social Security. We didn’t have Social Security so it’s unlikely he had been thinking about it. So I don’t think he thought about time going on forever, but that doesn’t mean his methods aren’t–he died, by the way, in 1947, I think, something like that, so right around the time Allais wrote his paper. So what is it that he said? All his lessons are going to hold true. The first thing he said is that look, in every period there are qs on every side of things. Here are qt, qt, qt+1, qt+1, qt+1. So if you just double–there’s no loss in generality by taking all the qts to be 1. We have no theory of inflation yet, because there’s no money or anything. So you might as well assume we’re measuring everything in terms of apples and take qt to be 1. So without loss of generality, as they say, qt = 1, and of course that means we can divide every equation by qt. So pit divided by qt would go here and we’d have a 1 and a 1. We divide this one by qt+1, still it’s an equation. We have Z less than or equal to 1 + pit + 1 over qt + 1 + 1 times 1 times theta, so we just re-normalize all the prices. So, re-normalize all nominal prices in terms of apples. So one simplifying thing is we can get rid of–so think of pit as the price of land in terms of apples. So we just get rid of all the qs here. Just assume that they’re 1, and so we have this equation. And now that means that pit = price of land at time t in terms of apples at time t. So that was a normalization we did many times before. We said that we might as well assume the contemporaneous price. We can’t figure out what inflation is, so let’s figure there’s no inflation. The price of apples is always 1 and we’re going to measure the price of land in terms of apples. So we get the same equation that now looks a lot simpler. So the qs, we don’t have to really worry about. We’re just worrying about the pis every period. So what did Fisher say to do? So we’ve got to worry about–what did Fisher say to do? What was his–whenever you have an economy, a stock market economy like this, what did he say to do? What was his advice? He said turn it into general equilibrium. How? By doing what? Yeah? Professor John Geanakoplos: So Fisher said, Fisher’s lesson, forget about assets by putting their dividends into the endowments. That’s his first lesson. So you see this is a good summary of what we’ve learned so far, and a second lesson was look at present value prices. So he says forget all these pis and things like that. Just look at the present value. So we’re looking at p1, p2, p3 … where pt, price at time 0, let’s say or time 1, it doesn’t matter, price at time 1 of an apple at time t. So once you knew the presence of the endowment then, I’m not going to write all this, the endowment of all generations 1 and above it stays the same, (3, 1), (3, 1), (3, 1), but the endowment of generation 0 is now 1, 1, 1, 1, 1, 1, 1 forever. And the budget set, everybody’s going to have a budget set determined by the ps. So now we’re just one step from solving this. So there’s one more thing to notice before we can solve it, so by symmetry, so observe that by symmetry we can hope to find an equilibrium with pt+1 over pt = p, a constant. So every generation is the same. The only relevant price for a generation is the tradeoff between the price of goods when they’re young and the price of goods when they’re old. That’s what Fisher said. The veil of the stock market is just a means of transferring wealth between when you’re young and when you’re old, and really you should calculate–all these guys have to calculate. If I buy the stock now when I’m young it’s going to cost me a certain amount of money and I’m going to be able to get a return. So the real rate of return, right, that they’re all going to calculate is going to equal–we’ll, by putting in pit dollars today they get out pit+1 + the dividend, 1, tomorrow, right? So tomorrow they’re going to get pit+1 + 1. So if they buy 1 share of stock it costs them pit and tomorrow they get pitapples, we’re measuring in terms of apples, and in the future they get pit+1 + 1 apple in the future. So that’s the real rate of return. That’s like 1 + r, 1 + rt, but we’re going to assume that that’s a constant. 1 + r we’re going to guess it’s a constant and that’s just 1 over this p that I told you about before, the ratio pt+1, the present value. So this ratio is just the interest rate between time t and time t + 1. So Fisher says you don’t have to think about all the stock market and what the return on the stock market and all that’s going to be. Really you’re just trading off. By doing all that calculation you’re figuring out what’s the tradeoff between time t goods and time t + 1 goods. In the Fisher economy you don’t look at the stock market. You assume that everybody knows the present value prices and therefore the tradeoff between time t and time t + 1 goods, and we’re going to assume that’s a constant because the thing’s so symmetric how else could it turn out except a constant. So now we’re ready to solve it. We’ve done all the tricks, almost, to solve it. So what is equilibrium going to be? So here’s equilibrium. It’s going to be a very simple equation. At every generation you’re going to have an old and a young. So what is the total supply of goods in every generation? How much goods are there? There’s 1 for the old apple. All right, if you look at any generation like this one at time 2 there’s that one, no not that one, a little less. The one in the middle that’s the 1 for the old guy, then there’s the young guy who has 3, right, and then there’s the apple that the land produces. So this is young apples and this is the dividend of apples. So that’s how many apples there are in the economy. So who’s going to be eating them? Well, there’s going to be an old guy eating apples and there’s going to be a young guy eating apples. So how much is the old guy going to eat? Well, the old guy’s going to spend half his money, and how much money does he have? Well, from his point of view he’s just trading off when he’s young against when he’s old. So from his point of view he’s got 3 apples when he’s young plus 1 apple when he’s old, but that’s worth, to him, the tradeoff between apples when he’s young and when he’s old is just given by p, divided by p. All right, so this is the whole trick. So we have to spend a minute until this dawns on you why this is true. And now what’s the young going to do? The young generation, what’s their income? Well, they only care about the tradeoff between prices when they’re young and when they’re old. So when they’re young and when they’re old they don’t care about land according to Fisher. They don’t have to think about that. They just have to know the price, which we’re assuming is p for everybody, the tradeoff between young apples which are worth more than old apples. So to them they have the same income 3 + 1 p.
Now, these ps refer to different time periods, but we’re assuming the same. Here’s the young. This is the young, so this is divided by 1. So this is the young and this is the old. And once I solve this equation we’ll have the whole equilibrium, but we need to understand this equation [note: the equation is: (1 half times (3 + 1 p) over p + 1 half times (3 + 1 p) over 1) = 1 + 3 + 1 = 5]. So where did I get this equation? So let’s take any time period 2 like T = 2 for example. We know the total apples around that can be eaten are 5. That’s on the right hand side. The old guy’s apple, the young guy’s 3 apples and the land producing 1 apple, 5 apples in all. Now who’s going to be eating the apples? There are going to be old guys and there are going to be young guys, eating apples. So the old will be the generation 1 guys. They’re going to be eating apples, and then the generation 2 guys are going to be eating apples. Now, the generation 2 people they’ve got 3 apples at time 2, so they’re looking at 3, but they’ve got expectations in their head. They’re going to think ahead. What’s the price of stock market today versus tomorrow? Fisher says they do all that thinking, they realize the tradeoff between consumption at time t when they’re young and consumption at time t + 1 when they’re old. That’s given by the price p. We’ve assumed there’s a price p.
So they’re going to say to themselves, “Okay, I’ve got 3 apples when I’m young, 1 apple when I’m old is not worth the same in present value terms–it’s just 3 + 1 P because the old apple’s not worth as much at time t as it as time t + 1, it’s 3 + 1p. I’m going to spend half of my income and the price when I’m young I’ve assumed that’s one.” So that’s what the young are doing. The old guys, now the old guys what they’re doing at time t depended on what they did when they were young. But when they were young at time 1, they knew there was a tradeoff between time 1 and time 2 apples, but we’ve assumed it’s the same price tradeoff, so we’ve assumed it’s the same p, and so they did the same calculation. When they were young they were going to spend half their money, this time 1 generation is going to spend half its money when it’s young, half its present value when young, divided by–so when they were young they were going to do that, but when they’re old now they’re looking forward to spending half their present value when they’re old, and the price of apples when they’re old is given by p relative to when they’re young. So they’re going to spend 1 half times the present value of their income, divided by the present value of the price of the old apple which is the apple we’re talking about because they’re consuming when they’re old now. So their consumption plus this consumption equals 5. Now, at least half of you must be baffled, so ask me a question to see if we can get to the bottom of this. That’s it. That’s the whole equation. As soon as we solve this we’ll figure out all the prices and everything in the whole economy. And so we’re at the end, but this requires a little bit of thought, so go ahead. Student: Shouldn’t it be 4 + 1 p because there’s the dividend, or maybe like 3 + 2 p? Student: I mean, where does the dividend fit in? Professor John Geanakoplos: That’s a good question. The dividend fit in here because, yes, there’s a dividend. Here’s the dividend that got produced, so there’s an apple to be eaten from the dividend, right? Now, you’re saying–so it’s a very important question you’re asking. So it’s correct what I wrote, but it doesn’t sound correct. So what he’s saying, the question is, what happened to the dividend. This generation, say, this young generation, either one, say the old generation. The old generation, when they were young at time 1 they bought land looking forward to their old age. They sold the land, and they got the dividend. How come that’s not factoring in to their demand? That’s his question, right? The answer is because that’s precisely the point of what Fisher did. Fisher said, yes, in the real world everybody is thinking to themselves, like generation 1, “I’m young now. I’m buying the land because when I get old I’ll be able to resell it and I’ll also get the dividend.” But Fisher has thought ahead. Fisher’s saying if the guy’s going to think about pit+1, that’s what he’ll be able to sell the land for, and he’s going to think about the dividend he’s going to get, and his rate of return is therefore divided by how much he had to pay for the land today. That’s his rate of return. But see, the bottom thing is how many apples he had to give up, pit there, is how many apples he had to give up to get the land. The numerator is how many apples he gets next period after selling the land and taking the dividend. So that ratio is the tradeoff between apples today and apples in the future for him. So if he says to himself, what Fisher says, the only thing the guy cares about is that ratio, that tradeoff, which we’re calling p, 1 over p. That’s the tradeoff he’s going to have in his mind. And so what is his income? This guy began with no land. Only 0 began with the land. Everybody else buys the land only as a means of getting to more consumption when they’re old. So the whole point of Fisher’s insight is you don’t have to keep track of how the guy’s managing to get the payoff when he’s old. All he’s doing is he’s recognizing a tradeoff of 1 + r or 1 over p, that tradeoff between consumption when young and consumption when old and all he can do is turn his endowment when he is young into more endowment when he’s old at that ratio, and it doesn’t matter how he does it as long as we have the right ratio. So Fisher says forget about the assets. Just keep track of the present value prices and these will tell you the ratio of transformation of goods when young to when old and that’s all you need to know to make a decision. That’s the whole point of Fisher. You don’t need to think about the assets. Now, after we get the ps we’ll go back and figure out what the price of land is. Any other questions? Yes? Student: Can you explain again why the price of the second part is just 1? Why can you use 1 <>? Professor John Geanakoplos: Yes, because I’m taking p as the ratio. So p, this p is here, so it says if I had 1 apple at time t how many apples could I get at time t + 1, [correction: 1 over] p of them, right, because this ratio–so for every apple I have down here I can get [correction: 1 over] p apples at time t + 1. If the ratio of two prices is p it doesn’t matter what their levels are–so I might as well as think of one of them as 1 and the other one as p. I could think of the first one as 2 and the second one as 2 p. That would be the same thing, right? So if I thought of the first price as 2 and this price as 2 p I’d put a 2 here, a 2 here, and a 2 here and it wouldn’t change anything. Remember, we learned this the very–this is why the lessons of general equilibrium they seem so obvious and then you put them in a slightly different context and you realize how clever Fisher was. If you double all the prices you’re not going to change anything. It’s the price ratios that matter. So it’s the tradeoff between apples when young and apples when old that matter. If you assume that tradeoff is given by p you might as well assume that the first guy, for all we care, he might as well assume that he’s measuring the prices when he’s young in terms of 1, and the prices when he’s old in terms of p. Those were very good questions. This is a little confusing but when we go back to the original equilibrium it’ll be clearer, I think. But so that’s the only equation that we have to satisfy. So we can solve that equation now. Any other questions? Let’s solve that equation. That equation is I’m going to multiply by 2 p, so I’m going to get 10 p on the right-hand side, right? Because if I multiply by 2 p I get 5 times 2 p is 10 p. On the left-hand side I’m just going to get 3 + 1 p + 3 p + p squared. So if I rearrange I just get p squared–uh-oh, my usual problems here. p squared - 6 p + 3 = 0. p squared - 6 p + 3 = 0, so p = 6 + (and I’m using the quadratic formula which I assume you know) - b squared - 4–. So 6 squared - 4 times 1 times 3, minus 12, over 2 = 6 - the square root of 24 over 2. So the square root of 24 is a little bit less than 5, so this is going to be a little bit more than 1, sorry a little bit less than 5, so this will be a little bit more than 1, so the whole thing will be a little bit more than a half. So let’s say it’s .55. So here’s a crucial step. How did I know when I said 6 plus or minus, why did I take the minus? Because if I had taken 6 plus this I would have gotten a gigantic–well, let’s come back to that. So how did I know to take 6 minus that instead of 6 plus this? So if this is the p then what are the prices? What are Fisher’s prices? We’ve just solved for equilibrium and these prices are going to be–we call this 1, 1, maybe .55, .55 squared, .55 cubed etcetera. That’s what Fisher says the prices are. And we can now figure out everybody’s consumption. Y and Z, what’s Y going to equal? Y is this thing on the right, 1 half 3 + 1 p, so it’s .355 divided by 2. So that’s 1.775. And what’s Z? You should check. I’m going a little fast here for myself. 3.55 divided by 2 is 1.775, so what is Z? It’s going to be 1 and a half plus–no, it’s 3.5 divided by 1.1. Student: <> are those numbers <>. Professor John Geanakoplos: p is .5–I’m going too fast for you, ah ha! p is .55, right? I just got p. So if I want a C now, go back to consumption, what’s the consumption going to be when you’re young? It’s going to be, Y is going to be 3 + .55 divided by 2 which equals that, right, 3 + .55 that’s the guy’s income and he consumes a half when he’s young, so that’s 1.775. And when he’s old he’s going to have the same income, so 1.775 divided by p, so it’s going to be 1.775 divided by .55, and that you can see–no, that doesn’t look right. Yeah, that divided by p and that’s going to be a little bit more than 3 and so, in fact, if you solve it out it turns out to be 3.225. Did I go too fast there? I’m plugging in .55 there. So it’s 3.55 divided by a half. That was that number, 1.775 divided by p which was .55, so you can see it’s a little bit more than 3, because .55 into 1.7 is a little bit more than 3. In fact, if you solve it out to some decimal places it’s that. So we’ve solved what everybody does. Now we know what everyone’s going to do. The young are going to spend 1.775, are going to consume 1.775, they’re going to consume 1.775 here. They have an endowment of 3 apples. They’re not going to eat them all. They’re going to consume 1.775 of them. And then the old, at the same time, what are they doing? They’re consuming 3.225, but you notice that those things add up to 5, so the consumption when they’re young plus the consumption when they’re old–so the consumption of this old guy there is 3.225 and you add the consumption of that, yeah, I went too high there, the consumption of the young guy just under him is 1.775, the two of them add up to 5. That exactly clears the market. So at time 2 you repeat the same thing, at time 3, etcetera. So you see we’ve already cleared all the markets except the one at time 1 which looks more complicated, but we’ve cleared all the markets. Now, what’s the price of land going to be? What’s the price of land? Nowhere to write that. Let’s write it here. What’s the price of land which is going to be a constant? How do we figure that out? How would Fisher say you figure out the price of land? So the price of land at time 1, say, what would Fisher say? Yep? Student: Whatever the young guy would pay for it? Professor John Geanakoplos: That’s one way of getting it. So what’s he paying for it? Student: Whatever he doesn’t spend on his consumption. Professor John Geanakoplos: Right, so from this equation he spent 1.775. His income was 3, so what’s left over? What did he spend on land therefore? Professor John Geanakoplos: So the price of land has to be 1.225. Now, that’s not the way Fisher suggested finding out the price of land. What did he say you should do? What’s the fundamental theorem? Student: Present value of all the payments. Professor John Geanakoplos: And what is that? So the land pays 1 apple every period. Student: So it’s paying 1. Professor John Geanakoplos: So it’s paying 1 p + 1 times p squared + 1 times p cubed + 1 times p to the fourth, right, because looked at from the point of view of time 1 you get an apple next period relative to the apples today. That’s worth p. An apple in 2 periods is worth p squared at time 1 because an apple at time 2 is worth p apples at time 1 and worth p squared apples at time 0. So you just keep doing this, but this is a perpetuity and so therefore it’s equal to? Student: We’re going to <>. Professor John Geanakoplos: Yeah, 1 over r. So it’s equal to 1 over r, and so what’s r? So what’s r? How do we figure out what r is? Student: If we know p then we can find r.
Professor John Geanakoplos: 1 over 1 + r = p, right, = .55, so therefore 1 + r = 1 over .55 and r = (1 over .55) - 1. And so this is a little less than 2 - 1 is going to be like .81 or something, and you take 1 over .81 and you get the same number. So Fisher solved everything. I mean, the Fisher method solves it all. Let’s worry about time 1. We haven’t done that. So what happens every period? Every period like from 2 onwards, the young guys says, “Ah ha! I’ve got 3 apples. What am I going to do with them?” He says to himself, “Well, the price of the land is 1.225 so I could eat some of the apples or I could buy some land.” And what does he decide to do? He says, “Let me eat 1.775 apples and spend the rest of my money buying 1 acre of land. Now, why am I doing that? Because next period I know the price of land’s going to be the same 1.225 and I’m going to get a dividend of 1, so I’m going to be getting a rate of return (we just calculated) of 81 percent.” So this ratio up here, this is another thing, this also this number is equal to 1.225 + 1 divided by 1.225. That’s also equal to 1.81. Remember r we just calculated over here. Where did I do r? r was 81 percent. That’s the same number here, 81 percent. So everybody says to himself, “Given that there’s an 81 percent rate of interest I’m happy to hold the whole unit of land because at that rate of interest I’m just trading off consumption today for consumption when I’m old at the rate that I want to.” And at time 0 the market clears also. So we cleared the market for every time 2 through infinity, and that was by this equation. That was up here. By picking the right p we know every market from T = 2 onwards was clearing. And Fisher would say by Walras’ Law we don’t have to worry about time 1, that’s going to clear as well and sure enough it does. It’s a little bit different now. It’s just the old guy, but the old guy with his land which is 1.225 plus his dividend of 1–his land which is worth 1.225 and his dividend of–hope I wrote down the right price of land all this time. Oh, that would be bad. So the old guy, what does he do? He has his 1 apple plus he has the land so he’s going to consume–the old guy has his–oh, I see. So what happens at time 1? The old guy has his dividend that he had before, so he’s got the dividend of the land because he’s owned the land forever. So he gets the dividend of 1, so that’s 1, plus he has an endowment of one, so he’s consuming 2 now. Plus he sells the land for 1.225. So that all adds up to 3.225, and then if you add the young generation’s 1.775 that indeed clears the market at time 1. So the market’s going to clear in every single period, but we only had to solve it for periods 2 and onwards which were all symmetric because by Walras Law, according to Fisher, once it clears from time 2 onwards without even bothering to check we know it would have had to work at time 1 and sure enough it did. So as I said, let’s summarize now what we’ve done and then we can start drawing the lesson. So what we did is we started with a complicated model with land and people having to look forward and expect what the price of land was going to be depending on what the next generation wanted to hold, which depended on what they were going to think the generation of that were going to hold etcetera. Very complicated stuff. And we saw that to solve it was very simple. You just do the Fisher thing. If everybody’s rational you can forget about the assets and the land and turn everything into present value prices and put the endowments–so you forget about all the assets and just put the dividends into people’s endowments and look at all the present value prices, and the present values prices by symmetry, we’re assuming, just grow exponentially, decline exponentially. And then we can solve the one equation and figure out what that price was, the exponential number p that’s to the nth power gives the nth price, the present value price, so solving for that p we then cleared the markets. We found out what everyone’s going to do when young and when old, and by plugging in now Fisher’s formula, the price of every asset is the present value of its dividends, we figured out what the price of land was every period, so we’ve solved for the whole equilibrium and sure enough it clears. And in equilibrium everybody’s doing this calculation. If I buy land today I’m going to get that rate of return on the land which corresponds to the p. It’s going to be 81 percent, and so everything works out. So what’s this got to do with Social Security? Are there any questions about this? I sense a little bit of puzzlement still. You shouldn’t be that far away from understanding it, so let’s hear a question. What don’t you don’t understand? Just point to an equation you don’t understand. Yes. Good, brave of you. Student: How do we show that theta should equal 1? 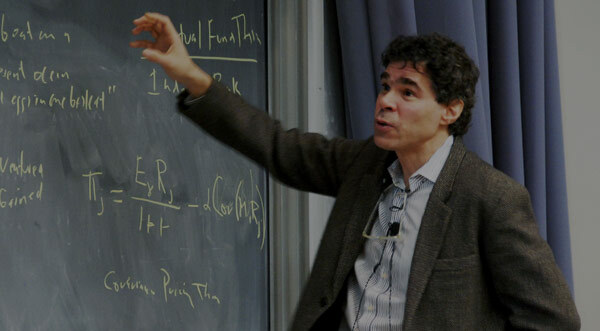 Professor John Geanakoplos: So Fisher says that–the way I solved it is I ignored the assets. So I didn’t pay attention to what the assets were. I just put the dividends in the endowment. I didn’t pay any attention to what people were holding of the assets because Fisher says forget the assets all together. Just do the present value prices and augment the endowments. And I found the present value prices by getting this factor p, and then it was just p to the n and I found what everyone was going to consume. That was it as far as Fisher’s concerned, but then Fisher says once we’ve found general equilibrium we can go back to financial equilibrium and figure out what the price of land is, which is the present value of the dividend, so it’s price is 1.225, and the step I left out, which you’re asking about, you can also figure out what assets everybody’s holding. So Fisher’s saying–what assets are they holding? Well, the guy, he’s consuming 1.775 here. We figured out the price there of 1.225 so it must be that he’s holding exactly 1 unit of the asset, and so the asset market is clearing too. But that’s no accident. Fisher’s saying if you clear all the markets doing the present value general equilibrium stuff and you go back to the financial equilibrium you’re automatically going to be clearing all those markets too. So I left out the step because somebody anticipated all that and got me to calculate the price of 1 in a cheating way, he said assume theta’s 1 then figure out how much money you’re spending on the asset, so we did that. What I should have done is done Fisher’s trick of figuring out the price of the asset, which is 1.225 and then, of course, we know the guy must have bought 1 asset in order to use up his budget set, but that clears the market for assets. But Fisher knew that was going to happen. It always has to happen. That’s the beauty of what he did. Yes? Student: So in that equation over there we have to assume p is less than 1? Professor John Geanakoplos: Yes, so the point is, thank you, I’m coming back to exactly that point. So the point is when you look at the present value of land it’s going to be p + p squared + p cubed + p to the fourth …. The present value of land had better be finite, so in other words p has to be less than 1 otherwise the value of land would be infinite and it wouldn’t make any sense because in the very first old guy with an infinite value of land would buy more apples than there possibly were in the world. So you know that the real interest rate has to be positive. If the real interest rate were less than 0, and you had some asset that paid a constant dividend forever, that asset would have an infinite value. So the presence of land, which pays a constant asset forever, forces the real rate of interest to be positive. So Samuelson and all his talk of negative real interest rates, it can’t really happen. Land’s going to pay some dividend probably forever, so there’s going to be a positive real rate of interest. And so it means in Social Security, if the young give up 1 to get 1 back when they’re old they’re always going to be losing because there’s a positive real rate of interest, and so every generation has to lose. So it’s precisely the point. Because of the presence of land you know that the real rate of interest is going to have to be positive. Fisher never made this argument. He said it’s impatience and maybe if people are incredibly patient it could even turn out to be negative, or if output was bigger [correction: smaller] next period than it is this period you could even have a negative rate of interest, but not so when you have land with a constant dividend forever. Then if the interest rate is constant it’d better be positive, otherwise the land would have infinite value. So it’s a new argument for a positive rate of interest. The land has to have a finite value. Any other questions? So when you solve for a couple of these you’re going to do it very easily, I mean, after you’ve done it a couple times this will seem very easy to you. I know it seems a little confusing now, but let’s just do a couple more thought experiments. Suppose we do Social Security? What will happen with Social Security? How does that work? What does Social Security mean? Well, Social Security means the young give the old something and until now we talked about it as if the young could give the old part of their endowment. The young pay taxes and the taxes get handed over to the old guy. That’s pay as you go and we talked as if it wouldn’t change the equilibrium, but we said at the same time that Social Security was the most gigantic program any government anywhere in the world has ever adopted and the giveaway was bigger than GNP for a year, 17 trillion compared to 12 or 14 trillion. So clearly it’s going to have an effect on the interest rate. So we ought to take that into account if we’re doing a more careful analysis of Social Security. So what would Social Security do? How would I take into account Social Security? Suppose every young person gave 1 apple to the old guy at the same time? How would I figure out what happened in the new equilibrium? How would the economy change? What would I change and solve differently? Well, all I would do is I would change this to a 2. Every young guy now only has 2 apples when he’s young because he’s given 1 of them to the old and the old would have 2. So all the way through here I would just change all this to 2, 2, 2, 2, 2, 2, 2. That’s what I would do. That’s the change. Then I have to re-solve the equilibrium. So how would that change? What would I change in my one equation? Well, the apples in the economy, the young apples, the guy’s only got 2, but the old’s got 2 and there’s still 1 apple coming from the land, so that’s still 5. But now every generation’s going to be behaving a little bit differently. They’re going to have 2 when they’re young and 2 when they’re old. This guy will have 2 when he’s young and 2 when he’s old and otherwise it’s the same thing. So I just re-solve for the equilibrium. So if I re-solve for the equilibrium multiplying by 2 p I’ll have 2 + 2 p + 4 p multiplying by 2 p. Sorry, I just confused myself. I multiplied by 2 p. I’ve got 2 + 2 p multiplying by 2 p. I have 2 p here, plus multiplying by 2 p I have 2 p squared here. Hope I’m doing this right. And I’ve got 10 p on the right like I had before. So now I’ve got 2 p squared - 10 p and that’s 4 p, so it’s still 6 p (it looks like) + 2 = 0. And so p = 6 + or - 36 - 8 over 4. And so that, I hope I did that right, I hope you’re checking it. So that turns out to be p is 2.8, no. Social Security, p is .38 now. So now it equals .38. So 6 - square root of 28 so it’s working out pretty much, so .38 is the new price, so therefore the interest rate 1 over 1 + r = .38. So what do you think happens to the interest rate? So r now equals–before I write it you can figure out what it is yourself in a second. Do you think the interest rate went up or down in the new economy? What would Fisher have said? Professor John Geanakoplos: Up, it went way up, and so it’s actually 347 percent. So the interest rate went from 81 percent to–no that can’t be right. It went to 161 percent. So the interest rate went up. So the loss is even worse than it seemed before. Remember, in present value terms, when you’re young you give up 1 and when you’re old you get 1 and so you lose the present value. So the present value of that trade is this plus that over 1 + r. Well, now that r has gone up you’re losing even more. So Social Security at the current interest rates looks bad for every generation. After you do the Social Security and everybody understands it’s happening it’s going to be even worse in terms of present value. So Social Security, again, everybody is giving something when they’re young to the old. So the guy at the very beginning, at the very top, gains a lot. Everybody else, every other generation loses and you can compute the utility after Social Security compared to before Social Security and it goes from something like 2.7 to 2.3. So there’s a substantial loss for everyone’s utility except for the first generation. On the other hand we rescued the first generation. Now, there are two more experiments. I’m not going to be able to finish today, but I’m going to mention them. Experiment one is suppose we had more and more children every generation? How would we take that into account? Well, it’s very simple to take into account. The same thing with the trivial change you can figure out what happens with more and more children. So I’m going to go back to (3, 1). This will only take me one minute. Sorry about this. I know time’s running out, but let me just finish this story. So if we had more and more children in every generation, so every 30 years let’s say the population doubled, that’s not such a high growth rate per year, you’d have 6 and 2 here and then it’d go up to 12 and 4. But, again, it’s all exponentially growing and the dividends would also be growing. So this would be 2 and 4 and 8 and 16 etcetera. But as you will see in a second–I won’t do it this time. Next time you’ll see that it’s very easy to solve for the new equilibrium. You put a double here thing because the young, there are twice as many young. You just solve it and you do the whole thing. And what happens is Social Security isn’t solved. Samuelson was in a way wrong again. Even though there are two young people for every old person–so every young person only has to give up half an apple. You only have to give up half an apple when you’re young and when you’re old you still get a whole apple back. It sounds like now surely you should gain, but the point is you don’t because the rate of interest gets higher. And then we’re going to have generations that alternate in size, but all these are very easy to solve once you figure this out. So on Thursday you have to solve a problem just like that so you get the hang of it, just one problem to do for Thursday.